This was the Blue Lagoon Island and Segway Tour. Blue Lagoon was a cool little area. Blue Lagoon was a cool little area. We loved the Segway tour - very cool experience and wonderful guides. Not really a great place to relax for a beach day, but fun excursions and great bar!! Great experience. Wish we had a little more time on the island. It was nice, the island is small and lots of waiting and only 50 minutes with the segways. Disclaimer: Our ship was re-routed due to hurricane Harvey in Western Caribbean. It was such a blast! We got to go to parts of the island that no one else was able to go to. We also got to go climb the old tower that is original to the island. Absolutely beautiful! We had never been on a Segway before and wanted the experience. This excursion was our favorite excursion that we have done in Nassau. Fun experience, easy to learn and had great guides....would definatly recommend! The guides Amin and Olive were nice and engaging. The guides Amin and Olive were nice and engaging. The Segway was easy to use and a lot of fun. Well worth the money spent! Segway tour of a private island. Segway tour of a private island. We loved it but only had limited time due to travel distance via ferry. Recommend this if you have adequate time in port. 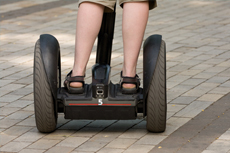 We had a segway tour with 2 guides after a short course on how to use the Segway. We had a segway tour with 2 guides after a short course on how to use the Segway. We rode along the road and in grassy areas. I felt safe.Guides were nice. AMAZING staff and very beautiful scenery! Fun! I would recommend it! This tour did not meet my expectations. This was the best excursion of the cruise. Unfortunately one of our family was ill so that meant that 3 did not go out of the 5 scheduled. The segway tour was fun. The segway tour was fun. The guides may have been young, but were very friendly and professional. If yo are a beer drinker, try Kalik, it is really good.